If you’ve used a marketing automation tool to talk to customers, you’re familiar with the frustration of trying to send the right message, to the right people, at the right time. Things get complex real quick. Each customer is uniquely motivated, has different needs, and will get their own particular value from your product. So it clearly follows different people will need different messages to spur them to take action. No one series of messages is going to be right for every single customer. Today we are launching Smart Campaigns – our solution to what we see as the current issues with marketing automation tools. Rather than trying to guess the pathways people might take in your product, Smart Campaigns adapts the order of messages to match their behavior. We like to think of it as Google Maps compared to MapQuest. Let me explain. Creating and managing a personalized message schedule, delivered at the right time on the right device, is almost impossible once your business starts to grow. Current tools try to address this with behavior-based automation: If a user has done X action in the product, send them message Y; if they haven’t, send them message Z. The problem is marketers can quickly get lost in a rabbit hole of message journeys, decision trees and pathways. The tools force marketers to map every single permutation of options available to the customer, quickly creating huge amounts of complexity. This leads to a need for training sessions, dedicated marketing experts, and a huge investment of time. How did automation become so complex? The first email marketing campaign was sent in 1978 by the “Father of Spam”, Gary Thuerk. It generated a cool $13 million in sales of DEC workstations and confirmed that email was a powerful new channel for marketing. Email also promised a much lower cost than direct mail. When businesses started collecting rudimentary data about their customers, such as name, birthday, and sign-up date, the simplest form of automation was born. Businesses were able to setup auto-responders to thank people for signing up and congratulate them on their anniversary. Emails could be personalized with names and other fields but it was more “mail merge” than scaling personal communications. Cute, but not exactly powerful for marketers. As technology evolved marketers began messaging users based on how much time had passed since they signed up for their product, or gave them their email. This made it possible to automate messages with some relevancy, but it didn’t account for the different speeds at which different people learn to use a product. Just because they’ve been using your product for seven days, doesn’t make it the right time to tell them about power tips or keyboard shortcuts. Once it became possible to record and act on in-product behavior, marketers thought “the future is here!” Surely if we can send people messages based on their behavior all our problems are solved? Marketing teams quickly learned to use workflows, decision trees and journey builders so the right message would be triggered when a user took a particular action or met particular attributes (e.g. days since signed up, number of teammates added, etc). But this wasn’t scalable. As you start to track and act on more behaviors things get exponentially difficult. Behavior-based tools followed the same model as their predecessor, time-based automation; messages are sent in a linear, specific order, with a beginning and end to each customer journey. These journeys are hardwired, not responsive; if you don’t map the journey correctly, customers will receive mistimed or irrelevant messages. That’s because user actions don’t happen linearly and in the sequence we’d always like. They take different actions at different times, and in different orders. Before TomTom, Garmin, and then Google Maps, this was the best way to get directions somewhere. What you got were a list of directions to get you to your destination. But if you missed a turn, or took a wrong one, you were lost. 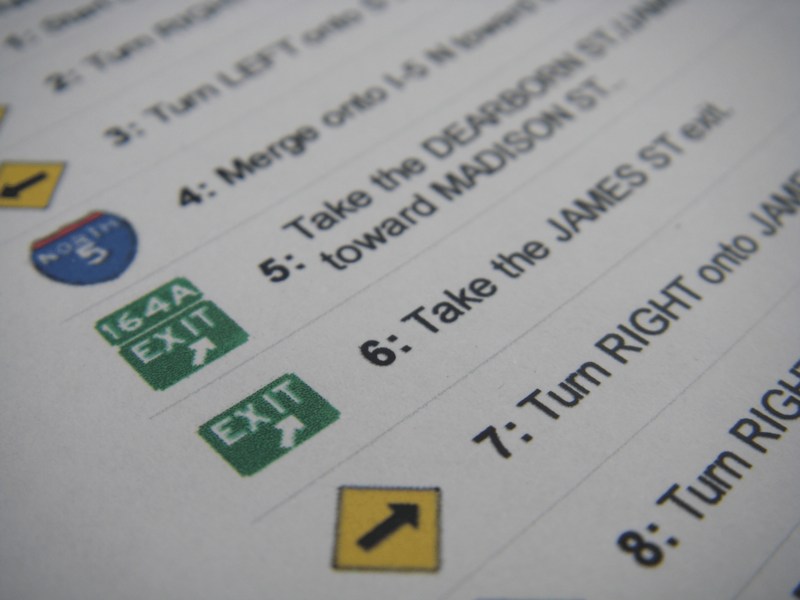 MapQuest’s printed directions couldn’t adjust based on traffic or missed turns, and that’s where it broke for people. 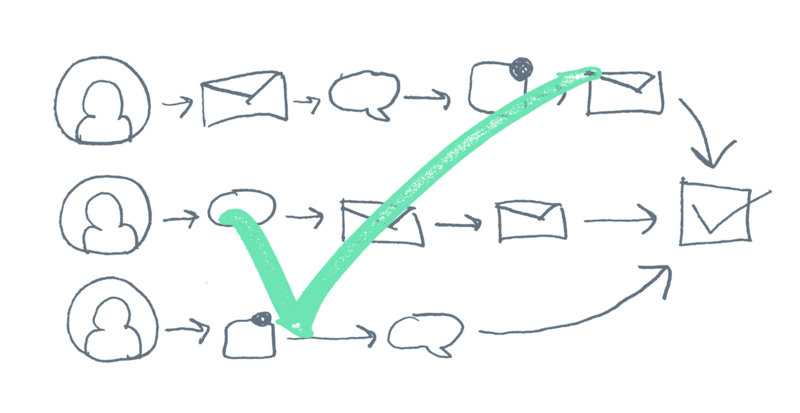 This, for the most part, is how most marketing automation works today – marketers have to try to think of every possible customer journey and then create a message schedule to match it. We like to think of Smart Campaigns as being Google Maps compared to MapQuest. 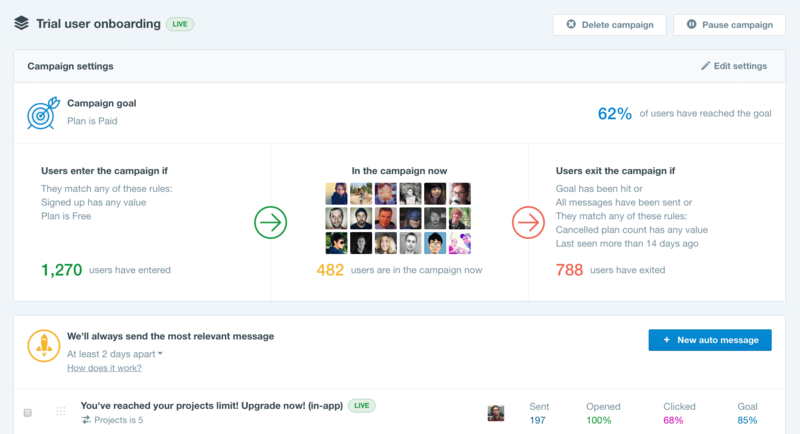 We launched behavior-based messaging in early 2014. Since then we’ve honed the capabilities of Intercom to deliver timely, relevant messages regardless of the platform, which could be lead nurturing, onboarding, upselling, or re-engagement. With Smart Campaigns we are making it even easier for you to send every lead, customer, or subscriber a tailored stream of messages based on their unique behavior. This new feature significantly reduces the burden of marketing automation – there’s no more routing message pathways and decision trees. First, choose the people you want to message and the goal you want to achieve, e.g. send a series of messages to people who start a trial to get them to become paying customers. Then decide how often you would like them to receive messages, e.g. you may want to send, at most, a message every two days. Choose triggers for your messages, based on time, behavior or interaction with other messages. Then simply rank them by priority, with the most important message listed first. When people are eligible to receive a new message, Intercom looks at all the messages in the campaign, identifies the ones the customer matches the rules for and sends them the highest priority message. This ensures Smart Campaigns always sends the most relevant messages to each person, eliminating unnecessary and time consuming complexities for marketers. We believe this will liberate businesses and allow them to focus on what matters – communicating with customers – rather than managing the tools of communication. Get the full story on Intercom’s Smart Campaigns here.